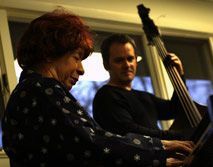 One of my all time favorites, friend and mentor, the legendary vocalist Shirley Horn, passed away last week at the age of 71. Despite a long bout with diabetes, and the loss of a leg, Horn continued to perform up until the end. Her last album, "May the Music Never End", provided us once more with a masterpiece that is just as timeless and inimitable as she was. The self-produced CD confirmed what many musicians have been saying about the Grammy award winner for years: she was indeed one of the finest vocalists in jazz music history. With an exclusive fan base that includes Barbara Streisand, Barry Manilow and opera soprano Renee Fleming, the Miles Davis protege relied only on the magic of her voice in this historical recording. For the first time in her flawless career, because of health concerns, Horn performed without her piano. Instead she permitted her long-time protege George Masterhazy and the veteran Ahmad Jamal to carry out the album's seamless piano performances. Jamal's appearances on "May the Music Never End" are remarkably significant as it is the pianist's first time as a sidemen on any recording. One of the most touching performances on the album was Horn's soulful interpretation of The Beatles classic, "Yesterday". The introductory re-record "Forget Me" is dedicated to Horn's late friend singer/poet Valerie Parks Brown. Her sweet rendition of the nostalgic Duke Ellington piece, "Take Love Easy" features Verve labelmate Roy Hargrove on fluegelhorn, as does the emotional "III Wind". With a select mix of originals and standards, "May the Music Never End" is an unblemished portrait of why Horn's legend will continue to be a part of jazz music's present and future. Horn was accompanied on "May the Music Never End" by her trio pianist George Mesterhazy, and two of my oldest friends, bassist Ed Howard and drummer Steve Williams. "Most of these are songs I grew up with," says Horn, who still lived in her native Washington, D.C. "My family loved music and there was always music around from the greatest singers and bands. Usually, I just learned the songs my mother used to sing around the home. I would ask her, 'What's the name of this one, what's the name of that one?' because I'd have the melody in my mind. I remember hearing Peggy Lee singing "Why Don't You Do Right." In fact, probably 75 percent of the songs I do are ones I heard at home." But Horn didn't set out to be a singer. "It was an accident," she explains. "What I remember first in my life is playing the piano. That's when I was four years old. I'd go to my grandmother's home. She had a parlor with a great big piano. The parlor was for company, and it was closed off with French doors. It was always cold, but I didn't want to do anything but just go in there and sit on the piano stool. I wasn't interested in playing with the kids outside. After several years of this my grandmother told my mother to get me lessons." Horn discovered the allure of her singing when, at 17, she was playing in a local restaurant/night club. "One night close to Christmas, this older gentleman who would regularly come in for dinner came with a teddy bear as tall as I. Somehow I knew that was for me," she recalls. Indeed, the patron sent her a note saying "If you sing 'Melancholy Baby' the teddy bear is yours." "I was very shy and it was hard for me to sing," Horn says, "but I wanted that teddy bear." Audiences continued to ask for songs and Horn eased into her role as a vocalist. "It was no big thing, but then I started to realize how much I loved to sing." One of her most requested tunes was "You're My Thrill." The song stayed in Horn's repertoire for more than twenty years whenever she played the One Step Down, which she remembers as "the best little jazz joint" in D.C. Now defunct, the One Step Down was also one of D.C.'s "places to be", for Shirley's annual New Year's Eve Show. The owner would often say to her, 'you've got to record that song'," she remembers, "and I said 'I'm going do it once I've made up my mind.'" Although content to stay at home, Horn was coaxed away to New York City in 1960 by Miles Davis. Notoriously disdainful of singers, Davis had been seduced by Horn's debut recording, "Embers and Ashes". He invited her to open for him at the Village Vanguard, catapulting her into a limelight she had never sought. After Horn retreated from view for much of the 1970s and 1980s to raise her daughter, she found her fame blossoming anew after her 1987 signing to Verve. In 1990, not long before his death in 1991, Davis added his graceful trumpet phrases to the title track of Horn's "You Won't Forget Me". In 1998, Horn paid tribute to her mentor with the brilliant "I Remember Miles", for which she won the Grammy award for Best Jazz Vocal Performance. All in all, Horn has garnered 7 consecutive Grammy nominations, and her albums "Here's to Life, Light Out of Darkness" (A Tribute to Ray Charles), and "I Love You, Paris" all soared to number one on the Billboard jazz charts. What Davis, Quincy Jones, and others heard as early as 1960 has been affirmed over the years by numerous awards and recognitions. In addition to her Grammy award and nominations, Horn has won 5 "Wammie" awards, (the Washington area's music industry award). In 1987, she was presented the Mayor's Arts Award for "Excellence in an Artistic Discipline" in Washington, DC. In 1990 Horn's "Close Enough for Love" album won one of France's premiere music awards, the Academie Du Jazz's Prix Billie Holiday. In 1993, she added the prestigious Edison Populair HR57 Award for "Here's to Life" to her stunning list of honors. Three years later, Horn was elected to the Lionel Hampton Jazz Hall of Fame. In 1998, Marilyn Bergman, President of ASCAP honored Horn "in recognition of over four decades of her unique and influential role in interpreting the American song," and in 1999, Horn was selected as the recipient of the Phineas Newborn, Jr. Award, with an all-star tribute concert in her honor. Most recently, she was voted #1 female vocalist in the New York Jazz Critics Awards and #1 jazz vocalist in DownBeat's Critics' Poll. Inviting listeners into an elegant and sincere musical embrace, "May the Music Never End" was the latest stunning result of Shirley Horn's singular ability to connect with her collaborators, her material, and her audience at the most heartfelt level. After seeing Shirley and the gang at her hotel last April, I commented on her return to the piano, and a wonderful show at the Masonic Auditorium. She told me that "I'm still going strong child, and I told you I was going to play that piano again".